Johnstone Country. Frontier Spirit Lives Here. ** ** The bestselling masters of the American West add a deadly new twist to the epic saga of U.S. Marshal Will Tanner. This time, the hunter becomes the hunted . . . ** ** EVIL NEVER SLEEPS ** ** He’s the most notorious cattle rustler in all of Texas. His name—Jebediah Cotton—strikes fear into the hearts of every rancher in the territory. So it’s more than a little strange that someone would shoot Cotton’s youngest son in the back. Whoever did it is either a coward, a fool, or a crazy man. Whoever did it must die. Even if he’s a U.S. deputy marshal named Will Tanner . . . So begins not one, but two of the deadliest manhunts in frontier history. As Will Tanner sets off into Oklahoma Territory in pursuit of godless bank robber named Parson McCoy, Jebediah Cotton sends his five remaining sons and cold-blooded brother-in-law after him. Will has no idea he’s being stalked. But when there are this many players in the game, a U.S. deputy marshal has two choices: kill them all or die trying . 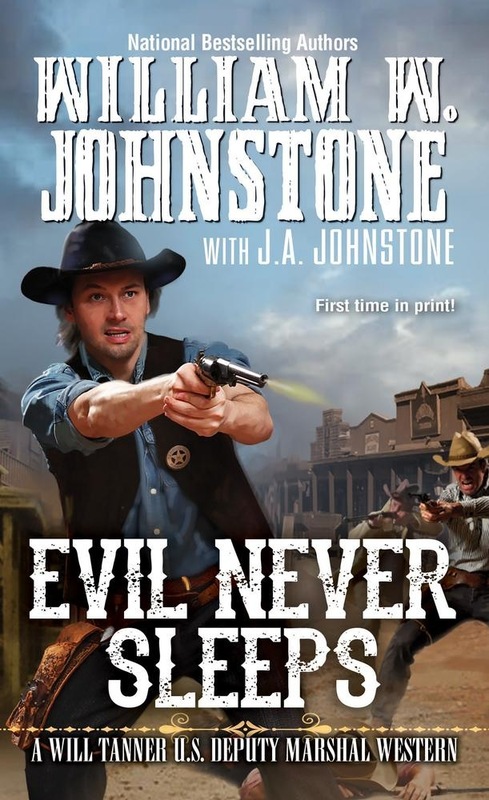 . .
Acquista Evil Never Sleeps in Epub: dopo aver letto l’ebook Evil Never Sleeps di J.A. Johnstone, William W. Johnstone ti invitiamo a lasciarci una Recensione qui sotto: sarà utile agli utenti che non abbiano ancora letto questo libro e che vogliano avere delle opinioni altrui. L’opinione su di un libro è molto soggettiva e per questo leggere eventuali recensioni negative non ci dovrà frenare dall’acquisto, anzi dovrà spingerci ad acquistare il libro in fretta per poter dire la nostra ed eventualmente smentire quanto commentato da altri, contribuendo ad arricchire più possibile i commenti e dare sempre più spunti di confronto al pubblico online.